Providing you the best range of automatic sliding gate system, automatic slide door system model: of5005v, automatic boom barrier, automatic swing gate opener and automatic slide door operator with effective & timely delivery. 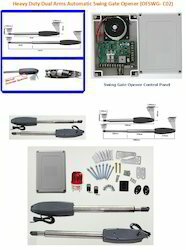 Heavy Duty Dual Arms Automatic Swing Gate Opener (OFSWG- C02) This double swing gate opening system is a robust, tuff, long lasting and a quiet opening and closing system for double swing gates up to 3m in length. The motor can handle light and heavy gates. The OFSWG-C02 is a sleek design telescopic linear screw type actuator that is made of stainless steel with a cast alloy motor housing. The two motors make up a durable and powerful 24V unit and the gear box is heavy duty and all gears are constructed of metal (no plastic, fibre or nylon). The OFSWG-C02 is fitted with an emergency manual override on each actuator to allow the user to open the gates manually in case of an emergency such as a power failure situation. • DC 24V voltage motor that is safe and compatible with back up power supply. • Copper made worm gear driving design ensures the motor longer working life and extremely quiet. • Super quick manually release with secure customized key in case of power failure. • Soft start and slow stop. 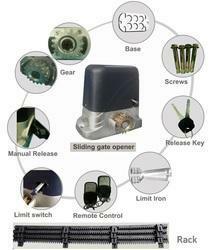 • Adjustable opening/closing interval time of double gate leaves. • Auto-stop if any obstacles detected during operation. • Built in max motor running time adjustable for multiple safety protection. • Separately adjust the force of double gate leaves. • Single leaf or double leaves operation. • Field tested by EU and US clients with Min 48000 open/close cycles. • Easy installation and low maintenance. • Easy to operate, and easy to connect wired. • Time Promotation Function: When open gate ,speed is slow, then a little quick, and when close the door, speed is slow again. • Stop working when gate meets with obstacle. • In case of power failure, release the clutch easily, and can operate the gate manually. • Rod's max travel is 300mm. • Full set use stainless steel alloy material and have water-proof function. • Working life about 8 years. 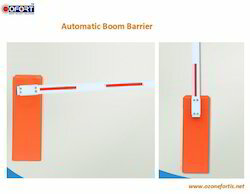 Looking for Auto Slide Door Gates Swing Gates And Boom Barrier ?